William John Reed Jr. “Bill” , age 84 of Gallatin, MO, passed away in the comfort of his home surrounded by his loving family on Sunday morning, February 3, 2019. Bill was born on August 21st, 1934 the son of William John Sr. and Irene Edna (Sump) Reed in Newton, Kansas. He was a graduate of the Jamesport High School. Bill married Karen (Smith) on May 21st, 1955 at the Christian Church in Gallatin. He served in the United States Air Force for over 22 years as a prop engine mechanic and retired with the rank of Master Sergeant. 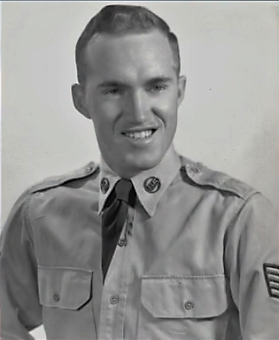 During his time of service, Bill served during the Korean and Vietnam conflicts. He was a member and Elder of the Seventh-Day Adventist Church. Bill also drove a propane truck for many years. Bill and his wife owned Karen’s Kake Kastle and bakery in Gallatin for over ten years where they made donuts and cakes. Since 1997, both were the Directors of the Adventist Community Service Center where he enjoyed volunteering his time with Karen in the thrift shop, Davis County Food Bank and Daviess County Commodities. Mr. Reed was preceded in death by his parents and brother, Robert Eugene Reed. Those left to celebrate his life include: wife of 63 years, Karen Reed; daughter, Kathy (David) Pedroza; son, Dennis (Stephanie) Reed; son, Robert Q Reed; daughter Patricia (Charlie) Thompson; 7 grandchildren and 4 great-grandchildren. The family requests no flowers. Memorials contributions are suggested to the Daviess County Food Bank (located at 1207 South Clay, Gallatin, MO 64640) in care of Stith Funeral Home in Gallatin. Memorial services will be held at 11 AM Friday morning February 8th, 2019 at the Gallatin First Christian Church with Pastor Russ Hamilton and Pastor Charlie Thompson officiating. The family will receive friends from 6 to 8 PM Thursday evening, February 7th, 2019 also at the church. Arrangements entrusted to Stith Funeral Home in Gallatin. Online guestbook at www.stithfamilyfunerals.com.